Matt Inouye played right field for the 'Bows the last two years and was drafted by the White Sox as a catcher yesterday. Major League baseball teams selected 11 more players with Hawaii connections yesterday, bringing the two-day total to 14 picks in the 2006 First-Year Player draft. Matt Inouye was taken in the 21st round by the Chicago White Sox. He was drafted as a catcher, the position he played at Mid-Pacific Institute and for his first two seasons with the Hawaii Rainbows. "I tried not to think about the draft too much, but the anticipation was a big factor in how much sleep I got," said Inouye, who will sign. "It feels good to have it be over. It is a weight off my shoulders." 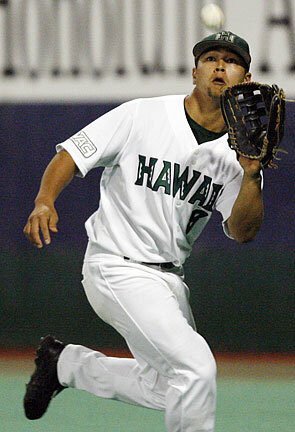 Inouye, who played right field the last two years, was a taken in the 41st round in 2002 by the Boston Red Sox. "Matt is the consummate team player. I had promised him he would catch more this year, but we were a better club with him in the outfield. Matt will impress people in pro ball as a catcher," said UH coach Mike Trapasso. The White Sox used their next pick to take Kanekoa Texeira in the 22nd round. The right-hander from Kamehameha played for Saddleback Community College this year, where he was 6-1 with a 4.00 ERA. "Several teams watched me throw a bullpen after my season was over. I am going to sign," said Texeira, a 31st-round pick by the Milwaukee Brewers in 2005. The next Rainbow selected was catcher Esteban Lopez, who was taken in the 25th round by the Los Angeles Dodgers. He turned down an offer by the Philadelphia Phillies two years ago and joined the UH program instead. "I have no regrets going to Hawaii. It helped me out to become a better person and a better player," said Lopez, who will sign. "I'm excited to have the opportunity to go and play with an organization such as the Dodgers." Another senior, right-hander Patrick McGuigan from Mid-Pacific and the University of San Francisco, was a 27th-round selection by the Toronto Blue Jays. He was 12-3 with five saves and a 3.29 ERA for USF this year. "I wasn't getting my hopes up too high. I was just preparing to move out of my apartment when I got the call," said McGuigan. "Now, I'm very excited. I'm meeting with the scout in the next couple days and I'll sign." Darrell Fisherbaugh was the 1,499th selection, four from the end of the draft, by Boston in the 50th round. "How do you like that for better late than never," said Fisherbaugh, the junior right-hander who led the 'Bows with nine saves this year. "I don't know what I'm going to do. We'll have to see if there is any money and that is hard for the 50th round. Let's just say I don't want chump change." Trapasso said, "I would never tell a junior not to sign. That is his decision. Darrell has three years of college and wants the opportunity to play pro ball." Ian Mopas, picked by the Minnesota Twins in the 30th round, did not see much action for Golden West JC this spring. The Iolani grad appeared in seven games and had a 2-1 record. Mopas is scheduled to play in a summer league and the Twins will monitor his progress. He will be a summer "draft-and-follow," said Minnesota area scout Dan Cox. "Ian worked harder than we expected him to and we have every intention of signing him, either this summer or before next year's draft after he has another season of junior college." Mopas was a 26th-round pick by the Twins a year ago. The Twins also took Isaac Castillo, a second baseman from Waimea High School, in the 44th round. "I first saw Isaac play for the Hawaii Elite team in a showcase at Peoria (Ariz.) last fall," said Cox. "He is a switch-hitter with an advanced approach to hitting. We plan to send him to a JC for a year, where he can play against higher competition. He will be a draft-and-follow player." Kansas City picked two Oahu high school players. The Royals made right-hander Anthony Stovall (Kailua) their 35th round choice and took third baseman Colby Ho (Kaiser) in the 48th round. "Eric (Tokunaga, Kansas City scout) told me they were going to try and draft me. I was just hoping for the best," said Stovall. "The call woke me up, but I'm very happy and excited." Cameron Bayne, a right-hander from Saint Louis went in the 49th round to the Cincinnati Reds. "He probably will be a draft-and-follow," said Reds scout Randy Yamashiro. Bayne, who hasn't decided on a junior college, will play with the Hawaii Island Movers this summer. Walter Marciel, a left-hander from Iolani, was taken in the 36th round by the Tampa Bay Devil Rays. The only UH recruit selected was Matthew Jaimes, an outfielder and pitcher from Chino (Calif.) High School who was taken by the Texas Rangers as a third baseman in the 12th round on Tuesday. "The bulk of our recruiting class is intact. In reality, we came out of this draft fairly healthy," Trapasso said.